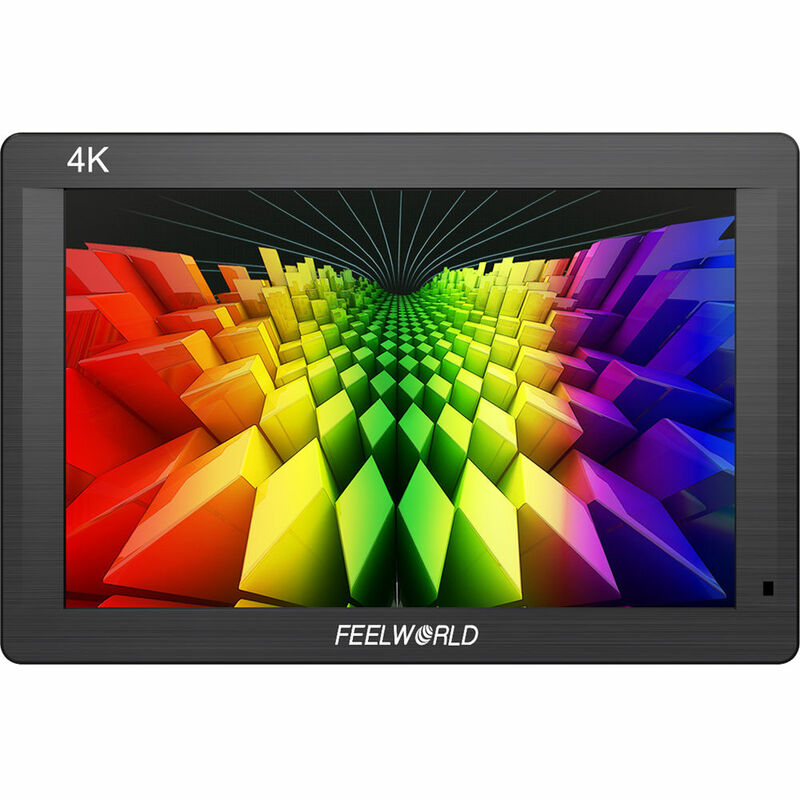 Featuring a 323 PPI (pixels-per-inch) IPS LCD panel, the FeelWorld FH7 7" On-Camera HDMI Monitor is up to the task of displaying SD, HD, or UHD 4K video. The LCD panel boast a 1920 x 1200 resolution, a 1200:1 contrast ratio, and a 450 cd/m² measured brightness for easy viewing indoors. Outdoor viewing can be accomplished using the included sun hood for blocking glare. The monitor's chassis is both thin and light at 0.9" and 11 oz, respectively. At the base of the monitor you'll find HDMI input and output connections in addition to a headphone jack. A 1/4"-20 thread for securing the monitor to the included shoe mount or to an optional articulating arm can also be found at the monitor's base. Any signal input into the HDMI input will be looped out to the HDMI output without modification. The back of the monitor hosts the included L-series battery plate, which will readily accept widely available L-series batteries. Different monitoring tools are built into the FH7, including a histogram, false color, and zebras for checking exposure, peaking and magnification for checking focus, and markers for ensuring correct framing. Box Dimensions (LxWxH) 8.9 x 6.4 x 3.2"
FH7 7" IPS LCD On-Camera HDMI Monitor is rated 4.3 out of 5 by 10. Rated 4 out of 5 by andres c. from Works incredibly great for the price It's super light, it has a great IPS image, nice colors and so many options for monitoring. The anamorphic desqueeze was a nice surprise and the lcd panel is so nice for this price. You can't beat so many great stuff for such a low price. Just consider this is a very very cheap monitor for a reason: The quality of the monitor feels not very sturdy at all, it only has one mounting hole, has very ugly menu and the included hood is from the worst quality you can get. But still, the image quality is almost as good as the ikan DH7 wich i also own. So, if you're into budget and need a great monitor you will take care of, buy it. If not, please get other options much more sturdy, for this price you can't really repair it. Rated 4 out of 5 by Dakin from Great image, great price The image is great, especially for the price. The main feature it lacks is 3D lut support. I use this mainly with the a7 III, often shooting in slog3, and I really miss the 3D lut support. It won't even display the "gamma display assist" image from the camera. But for the price, I'll make do. The other thing is when I turn on HDMI display output on the camera, so I can see all the camera displays icons, timecode etc, it shrinks the image and doesn't use the whole screen. Not sure why this is the case, but it's too bad. Rated 5 out of 5 by Maher I. from Nice Quality! This is my first monitor and I love it, I use it at church and I needed the HDMI loop. don't let the price fool you! my camera men love it! i just wish it came with the power supply! Rated 5 out of 5 by Steve from Good product So far it's working great. Appears to be made well. I use it for a mini teleprompter. Rated 1 out of 5 by Leigh from Weak and cheaply made I have a few Feelworld screens. That are low quality and have wimpy images. I keep seeing them rename the same junk. Sad. Anything from this company is trash. I regret getting anything from them. Should have stuck with normal brands. Rated 5 out of 5 by Tom M. from Great Monitor Works really great with no complaints. Rated 5 out of 5 by David from Muy funcional :) Este monitor lo compre por curiosidad y me agrado mucho su diseño compacto, funciona muy bien para PC, Blu-ray and DVD players, cámaras y equipos con salidas HDMI ofreciendo una gran calidad de imagen. Me gusta su utilidad en espacios pequeños donde no necesito usar una TV grande para escuchar música en reproductores DVDs. Pues solo deseo visualizar el menú de canciones para elegir. Rated 4 out of 5 by Jason from Feelworld 7 FeelWorld Monitors are substantially less expensive than a lot of Top Models but for my usage, theyre much better. I like the lighter weight. Some photographers would call them Light and Flimsy but for me, this is an advantage. On the FeelWorld website (http://www.feelworld.cn/ShowInfo.aspx?id=481&amp;py=FEELWORLD-7-IPS-Full-HD-1920x1200-4K-HDMI-Input-Output-On-camera-Monitor-F7) it shows Optional LP-E6 Plate. I have lots of LP-E6 Batteries and prefer not to have to buy more, I know you have answered previously that was 6 months ago so wondering if it has changed? Why F7 is discontinued ? What extra features FH7 has? I watched some youtube videos, Why the menu looks so different on FH7 from F7? We are not made aware of the reasons why a product is discontinued from the Manufacture. We can tell you that this monitor is an IPS screen, something the F7 was not. That means it uses a bit of a higher quality screen than the original monitor. Where can I get the option LP-E6 battery plate for the FW-FH7 model ? Can this monitor be used in still photography? What I'm looking for is to be able to fine focus in macro photo in the field. Yes, this will do as you wish. Since it has colored focus peaking, it should be even better for manual focus. Just be sure that the camera has an HDMI output and to set up the camera for Live View. In time, you may wish to consider the superb quality and ruggedness of SmallHD products like their Focus monitor. Can I use it with my Canon 6D ? Yes, you will be able to use this monitor with a Canon 6D. Keep in mind that the Canon 6D does not have a clean HDMI output, there will be screen information present when you use it. Dose this have any latency? we are planing to buy for Panasonic AG-UX180 cameras for live events as a on-camera monitors. Thank you for the help. I am looking for a 7 monitor for my Panasonic UX180, which can output UHD at 60p. This FH7 monitor says it will only accept 30p. Does that mean the monitor will be blank and not work? Or will it just scale the 60p feed down to HD like it does the other 4k/UHD resolutions anyway? Thanks for any advice. For camcorders and monitors to work together generally the camcorder output and the monitor input must be matched perfectly. This monitor will not scale the FPS.